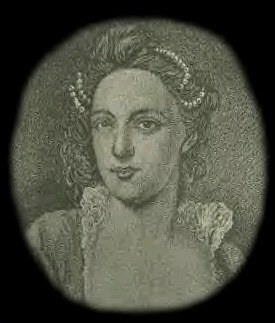 One of the most notable members of the Mackintosh family has to be "Colonel Anne Farquharson-MacKintosh"
who single-handly gathered 800 of her clan in support of "Bonnie Prince Charlie" in the year 1745 and placed them under the leadership of the MacGillivray chief at the Battle of Culloden.This contingent were the first to take the bolldy field and most were seriuosly wounded or killed. For her leadership she was the first woman in Scottish history to be given the title Colonel. Her husband, the Mackintosh chief, was in the service of the English King George at the time however this did not disuade this woman from pursuing her Jacobite cause..
As the story goes this miraculous woman along with a handful of her clan, fearing arrest and imprisionment, scared off 1500 British regulars, under the leadership of Lord Louden, by banging pots and pans, shooting off muskets and running feverishly through the woods near May Hall thus confusing the approaching British and convincing them they were far out numbered. This incident became know as the Rout of Moy. Col Anne was also famous for helping Bonnie Prince Charlie evade capture by the British and allowing him to stay in the family home during the 1745 uprising. Having fled the battle "Bonnie Prince Charlie" was aided by "Col. Anne" to make way to ships that would take him back to France ending forever the hopes of the Scottish people of the restoration of the crown and thier freedom from English tyranny. William Mackintosh, 21st chief of Mackintosh, died in 1741. Angus, 22nd of Mackintosh and the brother of the latter, the next chief, married Anne, daughter of Farquharson of Invercauld, a lady who distinguished herself greatly inthe rebelion of 1745. When her husband was appointed to one of the three new companies in Lord Loudon's Highlanders, raised in the beginning of that year, Lady Mackintosh traversed the country, and, in a very short time, enlisted 97 of the 100 men required for a captaincy. On the breaking out of the rebellion, she was equally energetic in favour of the Pretender, and, in the absence of Mackintosh, she raised two battalions of the clan for the prince, and placed them under the command of Colonel Macgillivray of Dunn maglass. In 1715 the Mackintoshes mustered 1,500 men under Old Borlum, but in 1745 scarcely one half of that number joined the forces of the Pretender. She conducted her followers in person to the rebel army at Inverness, and soon after her husband was taken prisoner by the insurgents, when the prince delivered him over to his lady, saying that "he could not be in better security, or more honourably treated". The story has finally been told of the love,faith and conviction that drove this woman to do what no other had done before.Though a romantic tale it also is one of tragedy and sorrow as so many of the clan were lost in the battle to restore the Stuart Dynasty. Col. Anne Farquharson Mackintosh, Scotland's famous rebel.